Here flies the third feathered friend in a recent trio that includes Corvus and Cygnus. Here, Aquila the Eagle soars in the richly hued night sky, above a dark landscape that includes a water tower. I’ve been wanting to paint water towers. The brightest star in Aquila is the prominent Altair – one corner of the summer triangle of stars. The Pioneer 11 spacecraft, which was launched in 1973, is heading toward one of the eagle’s stars, Lambda Aquilae, which is 125 light-years away. Pioneer will pass the star in about four million years. Although the spacecraft has already expired, it carries a message from home: a small plaque with information about the craft and its makers — a greeting to the galaxy from the people who made Pioneer 11. 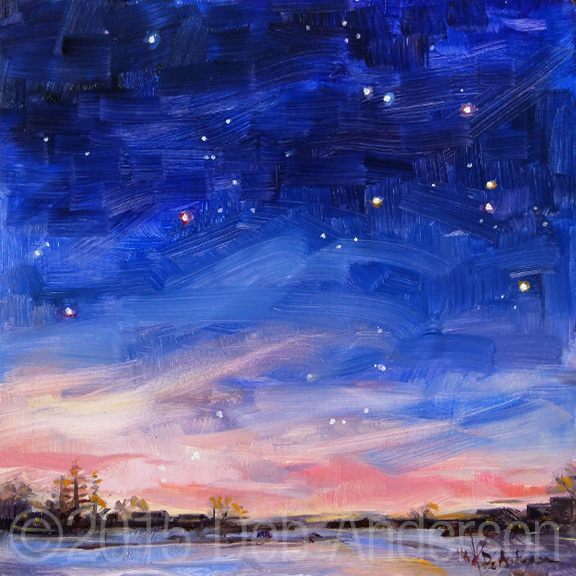 This entry was posted in night sky and tagged Aquila, Deb Anderson, nocturne, oil painting, stars.